I'm sitting back trying to remember the first Genesis song I experienced. Man, that goes back a long way. I was just a young pup back in the early 70's listening to my local album oriented rock station (remember when they called them that?) when I heard it. The station is St. Louis, KSHE 95. It was a particularly good one. They hadn't yet succumbed to the almighty advertising dollar. The only people that would buy airtime were the local "Head" shops, record stores and concert promoters. Radio was great back then. I can remember going to the radio station and talking to the DJ's while they were still on the air between songs. We'd always bring along a "peace offering" or two for our requests (if you know what I mean :-)). More often than not, the DJ's would play two or three songs back to back from the same artist. And if we were really lucky, we'd get an entire side of an album. Every time I listen to early Genesis, it transports me back to those days. I guess the first Genesis song I heard was Visions of Angels on the Trespass album. I'd only here it late at night. That's when the DJ's were at their best. They'd dig into there archive's of albums and play the really good music that didn't get spun during the day. I'd sit there until all hours of the night, listening on my headphones, just staring out the window, absolutely mesmerized. Nursery Cryme was originally released in 1971. This release was the 3rd of the British (soon to be) super group Genesis. Their previous two releases From Genesis to Revelation (UK 1969, US 1974) and Trespass (1970) had still left them as a relative unknown to the US and world audience. This album was a bit different. I guess you could call it their break though album, for the US market anyway. With songs like Musical Box, The Return of the Giant Hogweed and For Absent Friends receiving airplay in the States, people began to sit up and pay notice to this "new" band from the U.K.. The band members at the time were Peter Gabriel lead vocals, Phil Collins vocals and drums, Mike Rutherford bass guitar, Tony Banks keyboards and their latest arrival, Steve Hackett on guitar. I'm a Genesis fan from way back, in fact I think this was the second Genesis album I bought back in the mid seventies. Actually I've got two other copies of Nursery Cryme in my collection. 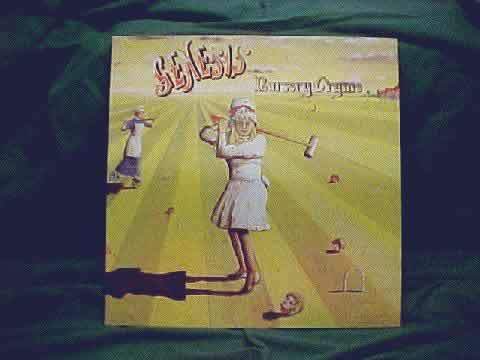 The first is a 1979 double release of both Nursery Cryme and Foxtrot in the same gatefold cover. That particular pressing isn't very good. It was pressed from an old master and cut from reground vinyl. The copy I listen to on a regular basis is Promotional DJ issue. It is very clean and sounded great, or so I thought until now. In December of 2000, Classic Records re-mastered and re-issued Nursery Cryme on 180 grams of pure virgin vinyl. The cover stayed true to form, gatefold, with the original artwork and liners notes. The only thing that changed was the addition of an anti-static sleeve. As for the recording, it got better, not just a little…..a lot. One of the first things I listen for in a piece of vinyl is surface noise. I didn't hear any, at all. So far so good. The next thing I do is turn it up and look at my woofers for rumble. If they are dancing back and forth without making any (audible) sound it tells me there are either imperfections in the stamper or poor quality control during the cutting. The other issue with rumble is you get tracking errors. The needle is (unnaturally) thrust back and forth in the record grooves causing an imbalanced sound. I cranked my system wide open and they didn't budge. Cool. Now it's time to sit down and really listen to the release. In a word, WOW! In the re-mastering process, Classic Records cleaned this up a lot. The bass is much firmer and better defined, the treble and midrange that used to be a bit harsh at times has now been tamed. Those were the first things that jumped out at me. So lets fast forward to one of my favorite tracks, For Absent Friends. This is a great song performed by Phil Collins on vocals and Mike Rutherford playing guitar in an acoustic session. Just a great song, light, fluid and creamy. Here I played my 30 year old (really good) copy then played the new Classic release a few times back to back to really hear the differences. And there are differences. On the old release Phil Collins' overdubbed vocals tend to blend together and are indistinguishable. Now they are separate and distinct. The sustain of cords is much longer and more apparent. It just sounded fabulous. Next, Return of the Giant Hogweed. Another great song. Peter Gabriel takes the vocal lead and the rest of the band joins in on this song. On my old copy this song can be a bit much to listen to higher volumes. It tends to mow you down with that "wall of sound" that's actually closer to distortion than music. The Classic release tamed that savage beast. It's far clearer and much easier to listen to, even at high volumes. Listening to this album still sends me reeling. I think I appreciate it now more than ever. Even more than when I first heard it. Why? Mainly because of Classics Records re-mastering process. The album is much more involving and musical. Before it was kind of dull. Now, it lives and breathes as music should. Early Genesis tends to be an acquired taste. In those days, Genesis was like no other band. They had a completely different approach to music, IMHO. They didn't just write and perform songs. They wanted you to live them. Peter Gabriel's early works can scare off even the most ardent music fan. Fortunately for me, I think of Genesis like a fine wine, the older the better. The bottom line is, if you like early Genesis, this album from Classic Records is a must. If you are a Genesis fan, Classic Records has re-issued several of the early Genesis releases. Foxtrot is available along with, Selling England by the Pound, and finally Genesis Live. We can only hope that folks at Classic Records are able to get the rights to re-issue The Lamb Lies Down On Broadway. Oh, just a little gossip, we might be seeing some of Peter Gabriel's solo work coming from Classic Records, too. Keep your fingers crossed. Again and again, Classic records does another GREAT job.